& Other Stories is an American women's clothing store located in New York City and a spin-off of the H&M company. With a mix of chic and elegant styles, this collection caters to a wide range of tastes and unique designs that help you stand out but stay comfortable. With Big Apple Buddy’s personal shopping service, you can now buy direct from the & Other Stories online store anytime, anywhere. Dive into the & Other Stories' collection of jumpsuits! The Seashell Print Jumpsuit is one of the newest and most popular models in the catalogue. The rainbow-colored seashell prints add a unique and outstanding design to the chichi and classy black look. The wrap v-neck gives it a feminine touch to this comfortable jumpsuit that you can wear with any accessory, at any occasion! Trying to spruce up your outfit? 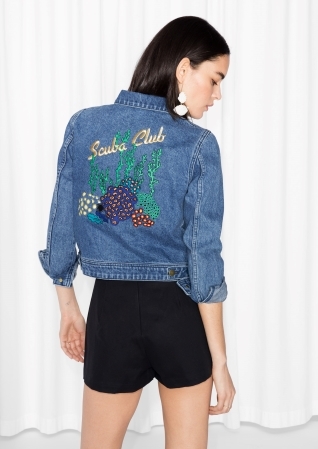 The & Other Stories' Embroidery Denim Jacket is the ultimate addition to any shirt, blouse, or tank top that you want to mix with. The embroidered back gives it an edgy and vintage look to bring out some attitude to your wardrobe. The light blue material is easy to combine with any other color or pattern. Show off another side of you with the denim jacket everyone's talking about! Get ready for the summer with & Other Stories' Embroidery Dress! This simple but subtly elegant dress is a must for those warmer nights out. The off white hue compliments any shoe or accessory you want to wear and the linen material is soft to the touch for a comfortable wear. Whether it's a business or casual event, you can't go wrong with this dress! It's a multi-ocassion, chic dress for everyone. Unfortunately, the USA & Other Stories online store does not currently offer international shipping. However, Big Apple Buddy, your personal shopper, can help you buy products direct from the official USA & Other Stories online store and ship them to your doorstep, no matter where you are in the world. We offer international shipping to over 110 countries including Australia, Austria, Belgium, France, Germany, Hong Kong, Ireland, Israel, Italy, Japan, Kuwait, Malaysia, the Netherlands, New Zealand, Norway, Saudi Arabia, Singapore, Spain, South Africa, Sweden, Switzerland, Taiwan, Thailand, the United Arab Emirates and the UK. If you would like to buy from the USA & Other Stories online store, simply let us know which items you would like to order (by filling out the form below) and we’ll get back to you with a free international shipping quote within 24 hours!